Meticulously blended from our favorite vineyards in Mendocino, Monterey and San Luis Obispo, Contour shines as an authentic example of exceptional California Pinot Noir. The carefully selected range of vineyards stretch along the Pacific coastline, defined by picturesque terraces; each is uniquely characterized by rolling hillsides with definitive contours, inspiring our wine’s name. Known for producing stellar Pinot Noirs, the 3 vineyard sites maintain a cooling maritime influence, balanced with optimal sun exposure and distinct regional soil conditions. This harmonious balance yields ideal growing conditions for the delicate clusters of Pinot Noir. Home to the famous Redwood forests, Mendocino County spreads northward from San Francisco Bay. With daily fluctuation of high and low temperatures, the grapes are able to maintain a balanced ratio of acidity to sugar and flavor formation. Mendocino also experiences a thick Pacific fog, which blankets the vineyards with low hanging cool air and creates an ideal condition for notable Pinot Noir. South of San Francisco and part of California’s Central Coast, Monterey is well known for producing abundant Pinot Noir and other cool climate grapes. The maritime influence of the region delays the harvest up to two weeks later than in other regions, allowing the grapes grown here to slowly mature and develop in flavor. 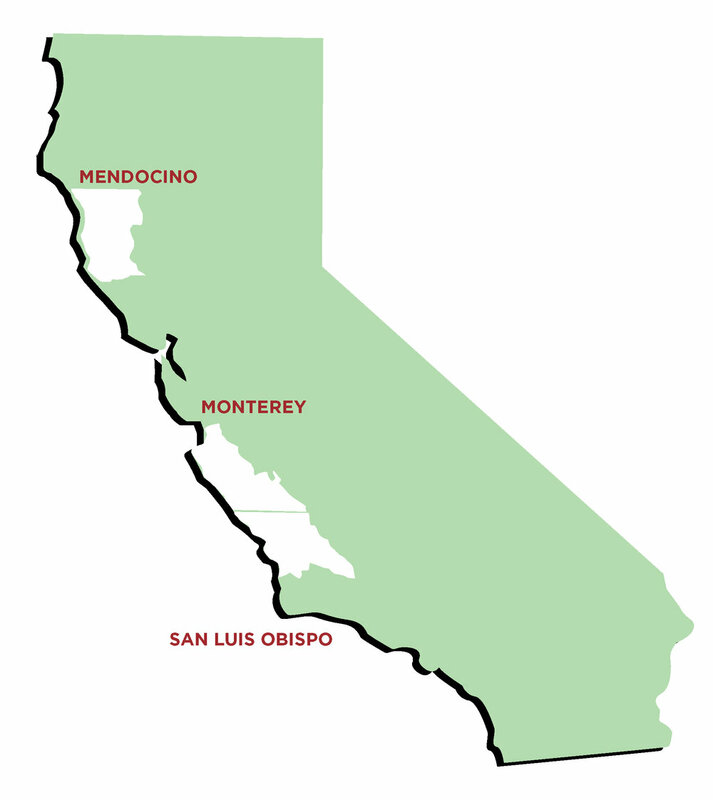 The vineyards of San Luis Obispo stretch along the coastal side of the Santa Lucia Mountains, providing a continuous maritime influence from the Pacific Ocean. The cool climate and presence of volcanic and calcareous soils contribute to intensely concentrated freshness and balanced acidity of Pinot Noir.